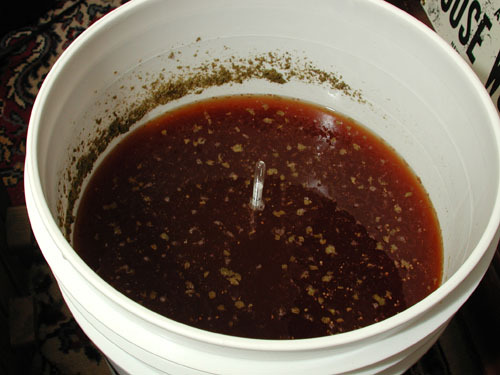 On Monday, October 8, 2001, I tried my hand at making beer at home. Over the past several months, I have been purchasing the necessary equipment to make beer. I have also been saving non-twist style beer bottles. Once I had amassed the equipment necessary, I purchased a home brew ingredient pack to make 5 gallons of “American Light” beer. The below table outlines what ingredients and equipment I used in this endeavor. 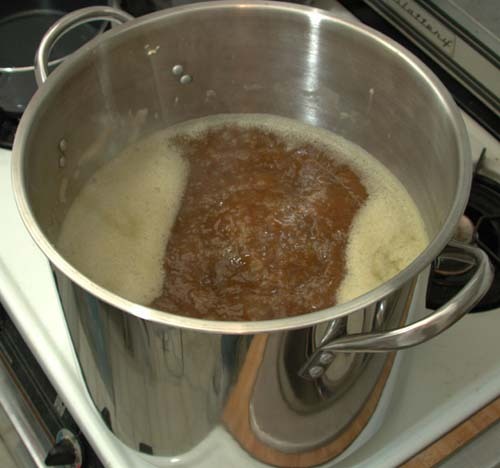 I brought two gallons of water to a boil in a four gallon pot and added the can of malt extract, dry malt extract and bittering hops (they look like rabbit turd and don’t smell much better). After the mixture returned to boil, I let it boil for 55 minutes. I then added the finishing hops (also looked like rabbit turd) and let it boil for five more minutes. 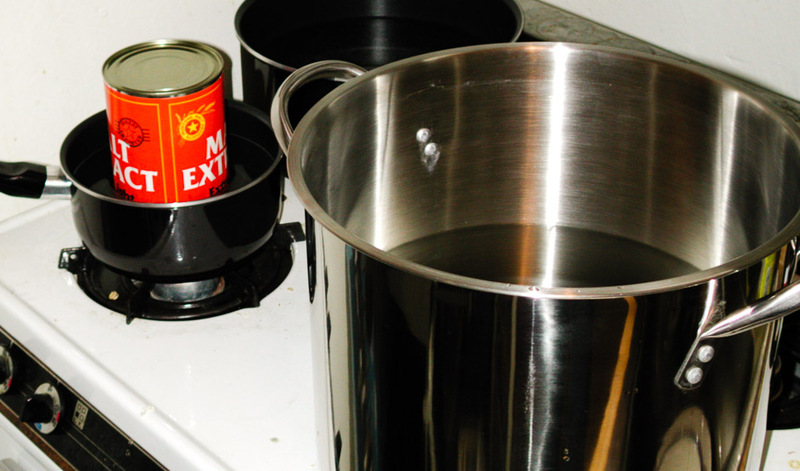 I removed the pot from the stove and poured the contents into a five gallon, food-grade, plastic bucket. 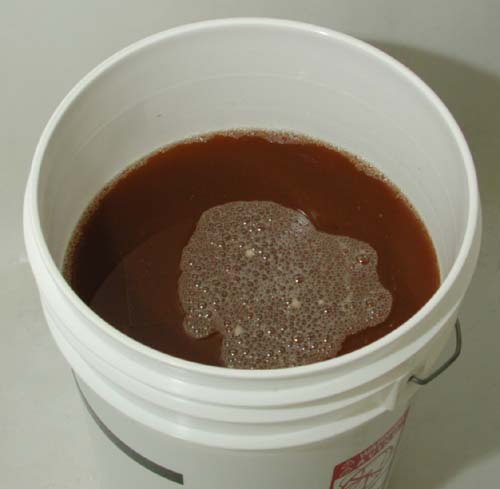 About 3½ gallons of cold water was added to the bucket until the level reached the 5 gallon line. The bucket top was then attached and the bucket was transferred to the bathtub (which was not easy because my neck and shoulder were quite sore from sleeping funny). The bathtub was filled and drained several times with cold water to bring the temperature of the wort down to about 70° quickly. After about 60 minutes, the temperature of the wort had cooled to about 70°. I removed the top of the bucket, took a starting gravity measurement with the hydrometer (1.040) and then sprinkled some yeast onto the wort and stirred well. 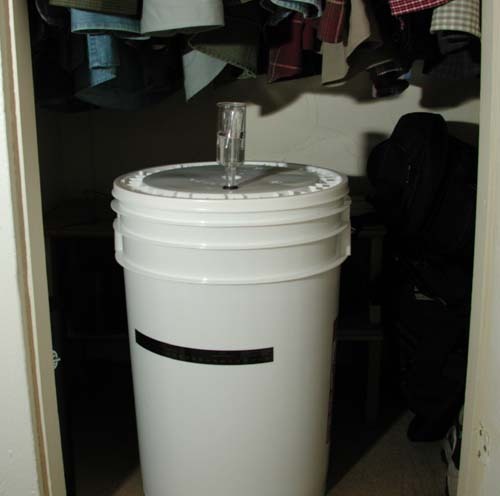 I reattached the top and made sure that the airlock was in place and half filled with water. The bucket was moved to a closet in my bedroom to keep it away from heat and light. I checked the bucket after about four hours. In the airlock, there seemed to be a lot of very tiny bubbles. I have to keep checking the airlock to see if the air bubbles stop. When they do, it indicates that the beer might be ready. 4 p.m. — Checked the temperature of the bucket and it’s a bit high at around 76°; should be between 68° and 72°. I’ll put some bags of ice around the bucket to try and keep the temp down. The airlock seems to be bubbling every few seconds. 10 p.m. — Checked the temperature of the bucket and it’s still a bit high. Moved the bucket into my living room where it is cooler. 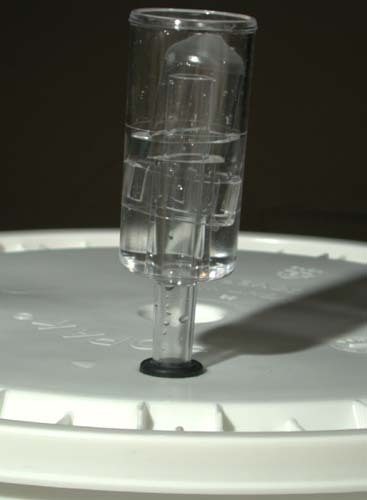 The airlock is still bubbling every few seconds. 7 p.m. — Checked the temperature of the bucket and it’s OK between 72° and 74°. Should be a bit lower, but it’ll have to do. The airlock seems to have stopped bubbling. It was supposed to continue to bubble for about three days. It concerns me that it has stopped so soon. I took a final gravity reading, and it is at 1.012. It still needs a few more days to reach the desired 1.007-1.010. 10 p.m. — The temperature is still somewhere between 72° and 74°. I watched the airlock between 8 p.m. and 10 p.m., and while it didn’t bubble, the center piece did move up about ⅔ of the way, so something is still happening. I took a final gravity reading, and it is still at 1.012. There’s no picture today since it’s the same as yesterday. 8 p.m. — The temperature is still somewhere between 72° and 74°. Doesn’t look like I can get it any lower. The center piece of the airlock is still rising ever so slowly. Final gravity reading is at 1.011. There’s no picture today since it’s the same as October 10th. 7 p.m. — The temperature is still somewhere between 72° and 74°. When I opened the top to take a final gravity reading (1.011), for the first time I could recognize the smell as somewhat like beer. 9 p.m. — OK, the beer making project has been deemed a disaster. The temperature never moved below 72°. The final gravity reading never moved below 1.011. A few people mentioned that the yeast never seemed to really activate. Oh well, this was just an experiment anyway.